Quick actions: Press down against the Safari icon on the Home screen to summon a Quick Actions menu. When you’ve applied the proper amount of force — and this may take getting used to — you’ll feel tactile feedback and see the menu. 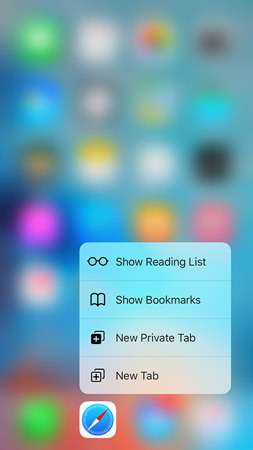 Tap the quick action you have in mind: Show Reading List, Show Bookmarks, New Private Tab, or New Tab. Peek and pop: Press against a link in a web page to get a peek at the underlying web page that the link represents. Again, you’ll feel tactile feedback. With your finger still pressed against the display, drag up to see a menu of additional options: Open in New Tab, Add to Reading List, and Copy. Or before you drag up, apply a bit of extra force to pop into the web page. If you don’t want to pop in, lift your finger. You see these shortcuts when you gently press down and hold against the Safari icon.